This was great news for the commercial prospect of the Florida Keys, as the airport can now deal with more tourists and returning “Conches” than ever before. 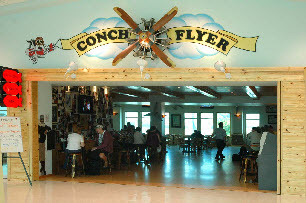 Our first tip to make your Florida Keys Travel experience more enjoyable is whilst you’re waiting in the airport, make sure you try out the Conch Flyer restaurant lounge. It will help you pass the time, as amongst the massive propellers taken from actual planes that hang from the walls, there are loads of pictures and memorabilia about the history of Key West. You can sit and savour one of the many cocktails it has on offer, whilst sitting on one of the stools converted from old propellers’. And don’t forget to try the food either. It maybe in an airport but don’t make the mistake that this is typical airline food. Even more than just being edible, the food is marvellous! Although Key West is an extremely popular destination for thousand of visitors each, do not expect to arrive here in Key West International Airport on a jumbo. To fly straight into paradise you will most probably need to take one of our "Commuter" planes. These planes are small, and flights are often overbooked in the peak seasons (Jan and Feb) so be sure to arrive early when you check in for your flight. Maybe you are not a visitor, or perhaps just meeting someone at Key West International airport. Short Term metered parking is available, as well as a long term and weekly options. So there are plenty of opportunities to leave your vehicle safe and sound whilst you make the most of the airport facilities. Although if you are interested in hiring a car some of the normal car rental companies are situated on site. Avis, Budget, Dollar and Hertz are all based within the airport terminal, whilst Alamo and Enterprise are just a courtesy call away. Whenever possible try to book your vehicle in advance, as you don’t want to be standing behind a queue of tourists whilst the sun is screaming....."Come and Get Me" outside. This will certainly speed things up and get you on your way. If you do need a taxi, then it’s just a simple case of going to the front of the Key West Airport and you will find loads awaiting the next incoming flight. Lastly, if you are staying in a hotel then enquire whether they offer a complimentary service. Many do and this will save you time and most importantly money.